Maple bats, which came into vogue after Barry Bonds’s success in 2001, are much more likely to suffer a “multi-piece break,” where the barrel completely separates from the handle. 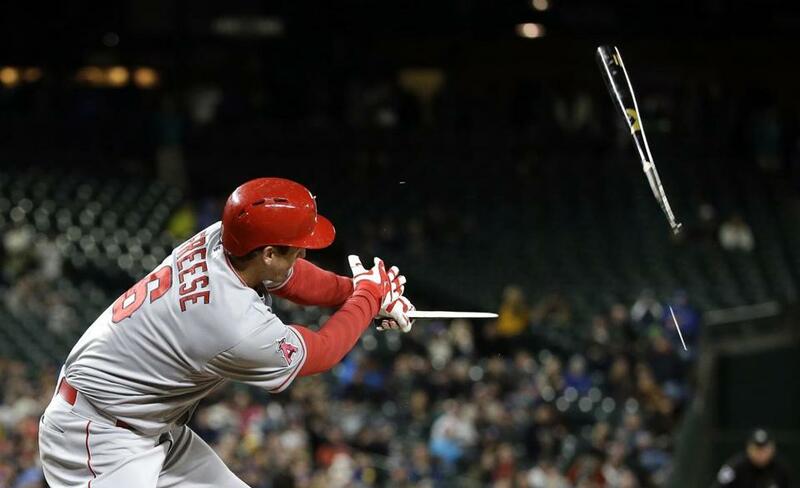 Above: Angels infielder David Freese suffered such a break earlier this season. In 2001, when Barry Bonds hit 73 home runs, shattering the season record, there were many wondering whether he had some hidden advantage that they couldn’t see. Many major league players, however, thought Bonds had an advantage that they could see. It was in his hands: a maple baseball bat. For half a century before Bonds’s record-breaking year, bats made from ash had been the standard in professional baseball. But after Bonds’s record-setting run, there was a rush to the harder wood of maple. And with that transition came a dangerous side effect. The maple bats were much more likely to suffer a “multi-piece break,” where the barrel completely separates from the handle. 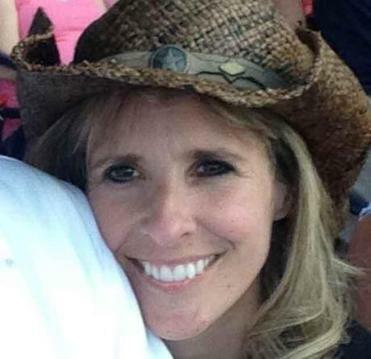 Last week at Fenway Park, just such a break seriously injured Tonya Carpenter, a 44-year-old woman from Paxton who sustained life-threatening injuries when the barrel of a broken maple bat went flying into the stands, striking her violently in the face. The gruesome incident, which was witnessed by her 8-year-old son and brought a hush to the ballpark, has renewed calls for tougher restrictions on maple bats, or outright bans. Speaking with reporters before the Major League Baseball draft Monday, commissioner Rob Manfred addressed the injuries to Carpenter and the issue of bat safety. Tonya Carpenter “is responsive and her condition has been upgraded from serious to fair,” her family said. “You have to react strongly to an incident like this,” said Manfred, promising that the league would reevaluate where it stood on the issue of safety. Manfred said that discussion would have to occur between the leagues, the teams, and the Players Association. In 2008, after a rash of multi-piece breaks and several high-profile incidents, the league convened a team of academics to study the problem. After reviewing thousands of broken bats, they concluded that maple bats were three times more likely than ash to break into multiple pieces, and attributed it to issues with the slope of the grain used in the manufacturing process, and ruptures caused by excessive bending. 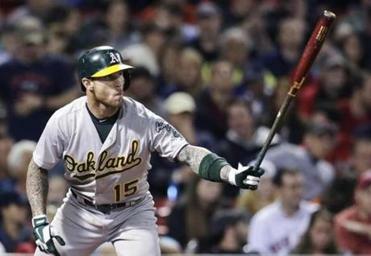 The maple bat used by Oakland’s Brett Lawrie split as he hit a ball last week, but an expert says it’s not the type of wood that is important, it’s the grain. Hernandez said the problem is that the fine grain of maple makes it difficult to see whether it’s straight, compared with ash, where the rings are easily visible. As a result of the study, the league instituted a host of new bat regulations for the 2009 season aimed at addressing the straightness of the grain, issuing a series of regulations that focused on manufacturing and inspection. The following year, the league decreased the maximum diameter allowed on bat barrels and increased the minimum diameter of bat handles. The changes have slowed the breakage — a Major League Baseball spokesperson said multi-piece bat failures are down by approximately 50 percent since the start of 2009 — but have not eliminated the dangers they create for players and fans. In 2010, Tyler Colvin of the Chicago Cubs was on third base when a teammate shattered his maple bat as he ripped a double down the line. As Colvin ran toward home, a shard from the bat penetrated his chest wall, sending him to the hospital for several days. 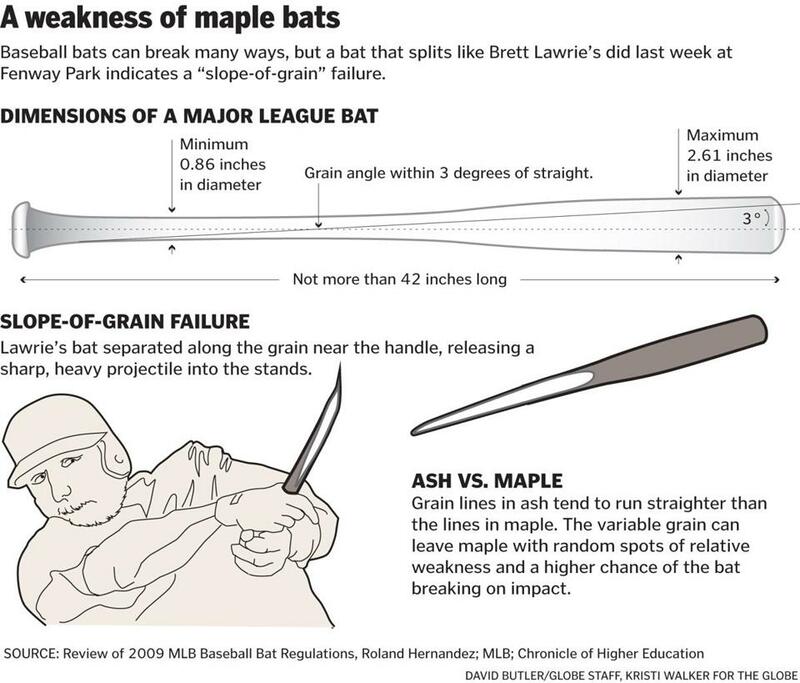 The horrible incident at Fenway Park last week may have reignited debate about the dangers of maple bats, but there are many who have long railed against them. Mark Grace, a former slick-hitting first baseman who is now an assistant hitting coach with the Arizona Diamondbacks, ranted about them for years when he was the Diamondbacks’ broadcaster. Jason Rosenberg, who covers the Yankees for the blog “It’s About the Money, Stupid,” is another who has been outspoken about the dangers of maple bats, and has criticized MLB for ignoring potential protections such as a polymer film that wraps around the bat to keep the barrel and handle in place should it suffer a failure. That technique and others have been tested at UMass-Lowell’s Baseball Research Center, whose director, professor James A. Sherwood, is considered an expert on the issue of broken bats. Sherwood, who was a member of the expert panel that studied maple bats in 2008, was unavailable to be interviewed by the Globe. A university spokesperson said he was away on a personal matter. Team owners are legally protected by a law known as the “Baseball Rule,” which absolves them of responsibility for injuries that result from foul balls or shattered bats, as long as netted or screened seats are in place for a reasonable number of spectators. The question now is whether fans are reasonably protected. “This incident has opened up a can of worms, and was terribly unfortunate, but it’s been quiet since 2009 when the new grading rules were implemented,” said Hernandez, the wood scientist. “But we’re talking about a wood product getting stressed by a baseball hitting the bat, and it will always have the potential to break.